State education officials have identified the subjects most in need of certified teachers next year, including science, math, English and reading. Hillsborough County, Fla. — More Florida teachers are teaching subjects they are not certified in, a report from the Florida Department of Education finds . State education officials have identified the subjects most in need of certified teachers next year, including science, math, English and reading. There’s also a lack of certified elementary school teachers, the report finds. The report also states that kids in schools rated a “D” are being taught by the most educators not certified in the subjects they’re teaching. In Hillsborough County schools, one of the Tampa Bay area’s largest school districts, leaders are considering making changes to their hiring and recruiting process. 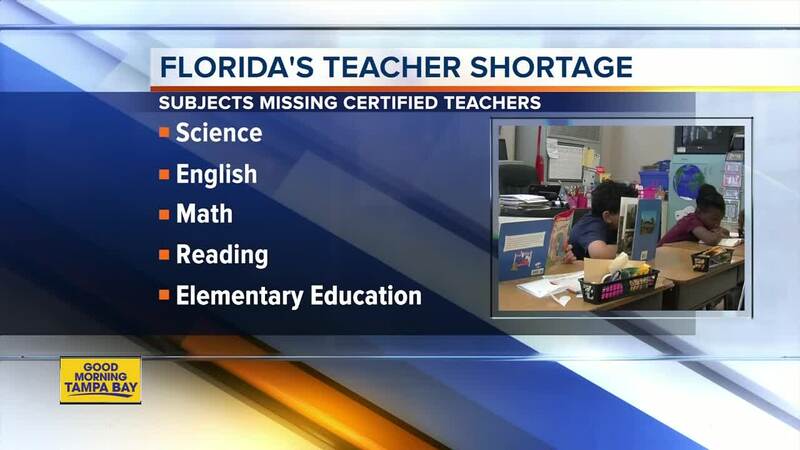 “We know hiring and recruiting needs to happen much earlier when there is the greatest number of teacher candidates in the pool,” said Tanya Arja, spokesperson for the Hillsborough County School District in a statement to ABC Action News. Arja said in some cases, Hillsborough Schools have long-term subs in classrooms. The vast majority hold Bachelors degrees and some are career changers or retired teachers looking to come back to the classroom temporarily, district leaders said. There is a nationwide teaching shortage, so all districts are likely dealing with the effects, Arja said.